(Newser) – Ira Gerhart finally found a place last year to fulfill his dream of opening a brewery: a 1923 Presbyterian church. It was cheap, charming, and just blocks from downtown Youngstown, Ohio. But soon after Gerhart announced his plans, residents and a minister at a nearby Baptist church complained about alcohol being served in the former house of worship. "If we didn't choose to do this, most likely, it'd fall down or get torn down," Gerhart says. "I told them we're not going to be a rowdy college bar." 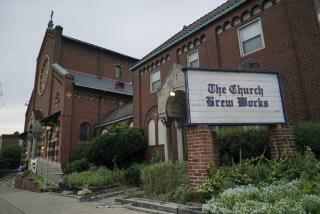 With stained glass, brick walls, and large sanctuaries ideal for holding vats and lots of drinkers, churches renovated into breweries attract beer lovers but can grate on the spiritual sensibilities of clergy and worshippers. Intelligent people AVOID the DANGEROUS ALCOHOL DRUG! "We don't want (churches) to become a liquor store," Then don't sell them. Are the bricks holy?